Today’s photograph is for you paleo-geeks … this nice crinoid stem is from a formation I forget the name of along the western flank of the Sacramento Mountains in New Mexico. If you have some knowledge about crinoids in general, or something specific about this one, please share in the comments. I forgot I had this photo until just now. It’s the Holder Formation up Yucca Canyon. I have a picture of that exact crinoid from 2007. It’s looking a little worse for wear now though. Ahhhh, that was a really good field trip. Thanks for posting a photo that brings back such good memories! This is actually in a place called Alamo Canyon … on the south end of Alamogordo. Is Yucca Canyon near there, perhaps? Ah sorry, wrong spot in my field notes. It is Alamo Canyon so it should be the Lake Valley Formation. I’m not sure if it’s the Alamogordo, Nunn, or Terra Blanca Member though. I don’t have which member the photo is from in my notes. I’ll post my picture of the crinoid up today. And what age might that be? If it’s Lake Valley, it’s Mississippian. The locality is right for Lake Valley. I grew up and went to college in south west Missouri (MSU is my alma mater) where the whole region sits on a Mississippian crinoidal limestone (Burlington formation) similar to that. I remember as a child going around picking up the stem segments and thinking they were beads of some kind, I have a few good specimens of them, plus a few calyx(s) and a blastoid calyx, plus an assortment of spiriferid brachiopods one as wide as my fist, and lacy bryozoans, and a few shark teeth. I don’t have access to them right now for pictures as I’m at work in Nevada. I remember from college someone saying that it took 15000-18000 crinoids to make up one cubic meter of rock, and the Burlington stretches from Iowa to Arkansas and from eastern Kansas to Kentucky, and runs about 30-50 meters thick. The Mississippian was a good time to be a crinoid. Ken … wow, 18,000 crinoids in one cubic meter. Dang! …there’s been some good feedback on this photo. Kudos, folks. My curiosity in this is because I’ll likely be moving to the El Paso or Las Cruces, N. M. area in a couple of years. I’d like to find some good crinoid collecting localities in New Mexico/west Texas to scratch my neverending itch for crinoids. I grew up in Trenton, Missouri on the north end of the state. Pennsylvanian, not Mississippian, crops out in that area. Lithology consists primarily of thin bedded marine limestones mudstones, and shales (usually Winterset Limestone/Galesburg Shale/Bethany Falls Limestone in descending order), although there are some non-marine sandstones containing plant fossils in a couple of areas (below the Bethany Falls, I think). I had the good fortune of discovering a fantastic crinoids collecting local only 18 miles from home. Your photo reminds me of marine Mississippian limestones that I’ve seen on occasion. The lacy bryozoa inside the looped upper part of the crinoid stem does indicate that the rock is most likely Paleozoic, and not younger. Identifying crinoids by columnals, alone, is virtually impossible (there’s a paper I have in my library published by the University of Kansas on this subject by the late R.C. Moore, PhD., but I don’t have it sitting in front of me). There are not enough disarticulated crinoid plates from the dorsal cup or crown in your photo to determine for sure if it’s Mississippian, but the rock and fossils “look right”. But as they say: “Beware Greeks Bearing Gifts” – – stratigraphic regimes can change dramatically from region to region, although the Mississippian marine facies seems to have covered a very large area. I had to relearn everything about what I knew when comparing some Texas Pennsylvanian rocks to their Missouri “eqivalents”. I’ve collected museum-quality crinoids from Missouri, Kansas, and Texas (which I’ve called home for 25 years). Most of the serious collecting has been confined to Permian and Pennsylvanian strata, so I’m no authority on Mississippian. Ron, thanks for the comment … I keep forgetting to update this post with the detailed information. But, yes, it is Mississippian and this locale is in a canyon called Alamo Canyon near the town of Alamogordo, New Mexico. 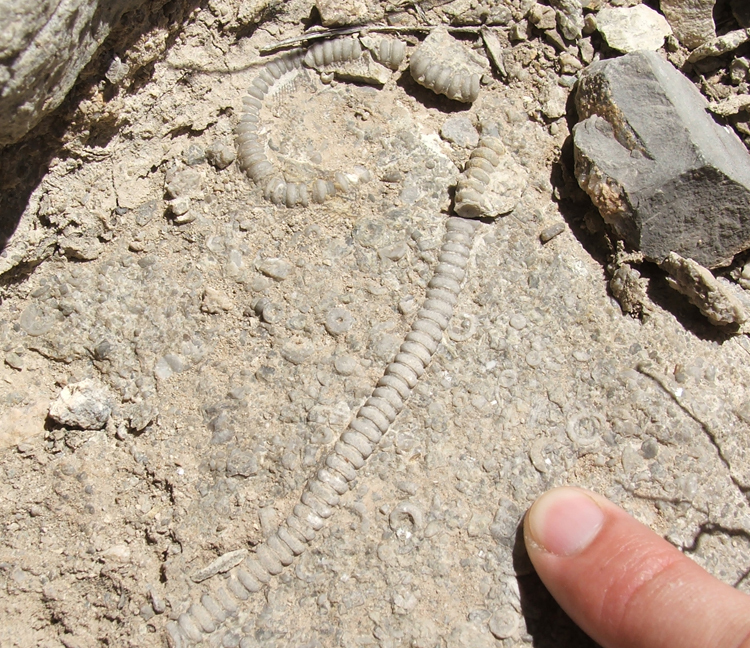 The fossil crinoid stem is from the Lake Valley just above the Cabellero Fm, so it is probably the Andrecio Member. It is Osagean in age. The locality is on the east side of Dead Man’s Branch off Alamo Canyon just east of Alamogordo New Mexico. Anyone interested can look for crinoid crowns there, but they are quite rare. Much more common in the ranges west of the Sacramentos. But the carbonate sedimentology of the area is pretty spectacular. You have the Lake Valley, Ranchera, and Helms Formations in the Miss, and the Gobbler Beeman and Holder in the Penn. Really nice “cyclothems” in the Penn! Pretty part of the world too. Aram … thanks so much for the detailed info on this site. It is indeed a pretty area, I’d like to go back soon! Beautiful stem !To dream of only finding a whole crinoid as I too collect..thx nice photo !